Aristotle is a loner whose content to keep to himself until one day Dante arrives on the scene. Aristotle who prefers to go by Ari is at his local neighborhood swimming pool. He doesn’t know how to swim, but at least he can stick his feet in the water. Dante notices him and offers to teach him to swim. This starts a new friendship for both teens. Dante is well liked, but doesn’t have any friends. Ari is the quiet, brooding type. Both teens learn to let their guards down and trust each other. Both of them are struggling with who they are in the world. I can relate with Ari. His relationship with his dad is one of occasional conversation, but nothing too, deep. Ari’s dad is a veteran who won’t talk about the war, is very reserved and quiet. My dad isn’t a vet, but he can be quiet and reserved around me. I think the relationship between these two characters is a great picture of how through life’s challenges the wall between a parent and child can be torn down. Mr. Saenz provides yet again a beautifully written book about friendship, love, figuring out who you are whether you like girls, boys, or possibly both. Ari’s story grabs you from chapter one. The cast of characters from Ari, Dante, their parents, Ari’s brother whose not mentioned at home and his extended family have all unique personalities. 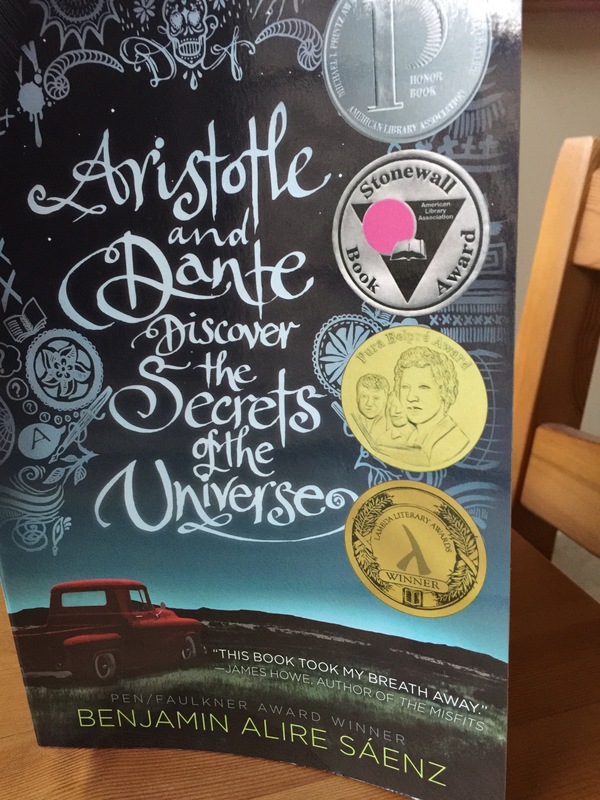 Ari and Dante’s friendship shows what true friends will go through for a best friend they truly care about. If you are looking for a story with funny, contemplative moments this is the book for you. What did you love about it? Have you read his other book? I loved how raw and emotional it was. It really tugs on the heartstrings. I haven’t read it yet but I definitely plan on it ASAP. I’ve heard so much about this book, but I haven’t gotten around to reading it yet! Jordan its one of my fave books read this year. I highly recommend it.